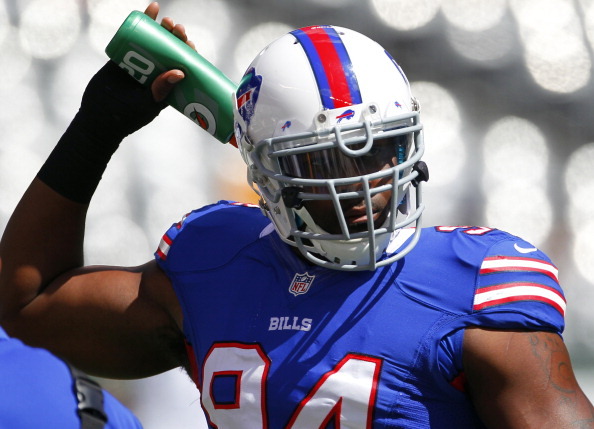 The NFL is investigating whether the Bills have violated any league policies by failing to list defensive end Mario Williams on the injury report, ESPN has reported. Tim Graham of the Buffalo News reports Williams hasn’t tried to hide the injury. He has grumbled about a sore left wrist for a few weeks and has worn a brace in plain view. Bills coach Chan Gailey first publicly mentioned Williams’ wrist injury Aug. 27. But Williams has yet to appear on an injury report this season. The issue is whether Williams should be listed or not. He has participated fully in every practice. That said, the NFL wants teams to identify injuries to reduce the chance of people trading inside information for gambling purposes. Gailey declined to comment about the ESPN report after Sunday’s 45-3 loss to the San Francisco 49ers. “All I do is I go out and I practice,” Williams said. “I brace it up, do whatever I need to do to practice, and I play in the game. Now, I don’t report anything. I don’t know all the odds and ends about [the injury report]. I don’t know if you go through practice if you report that or not. The players don’t control that.